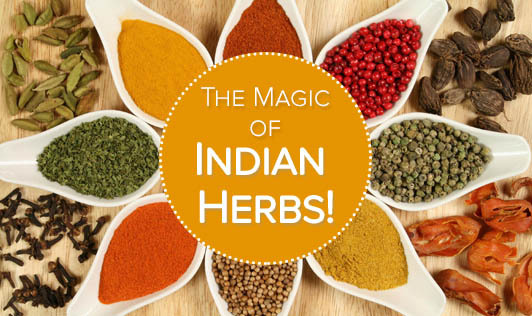 The Magic of Indian Herbs! An herb adds a lot of taste to your food and not calories. Herbs are known to be the best home remedies for many aliments like cold, cough, indigestion etc. A person planning to go on a weight loss diet or a person with diabetes can be blessed with the boon of adding a good amount of herbs in his diet. • Ginger is said to cure many gastro -intestinal problems. A bit of ginger in warm water after dinner is said to be beneficial. • Cinnamon appears to have some antibiotic and anti-inflammatory properties. Cinnamon helps in wound healing. • Bay leaf is said to protect one from cold. Bay leaves boiled in water with some ginger and mint can act as a good remedy for cold. • Aloe vera is always considered to be very beneficial. Aloe vera pulp is rich in anti oxidants and vitamins which will help in boosting our immunity. • Coriander leaves are one of the most common herbs that are available in the kitchen. This is said to have a good amount of minerals and vitamins and hence, it is one of the most added herbs in Indian cooking. • Garlic is famous for its good reputation for heart health and reduction in cholesterol. Eating 2 pieces of garlic on an empty stomach with exercise/yoga can help to get cholesterol levels under control. • Curry leaves are another common ingredient in Indian kitchens that helps in controlling diarrhea and maintain good eye sight. • Tamarind contains ingredients that might have laxative effects and activity against certain fungi and bacteria. Indian herbs can do wonders to our health. Include these herbs in your daily diet and stay fit and healthy.